Callum Madigan (red) has joined March from Netherton. 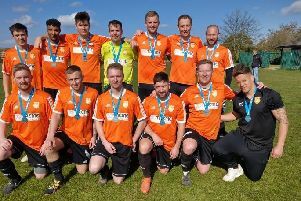 All-conquering Netherton United are back in action this weekend for the first time since completing their quadruple trophy haul last season. The Peterborough Premier Division champions take on Peterborough Polonia at the Grange on Saturday (12.30pm) in a friendly. Netherton have lost key defenders Ryan Wood and Callum Madigan from their successful team. Wood will manage Premier Division rivals Peterborough Sports Reserves, while Madigan has joined Thurlow Nunn Eastern Counties League side March Town United. Some local non-league clubs start their pre-season campaign on Saturday with altered kick-off times because of England’s World Cup quarter-final with Sweden (3pm kick-off). Peterborough Sports travel to Rothwell Corinthians before their big friendly against Peterborough United next Tuesday (July 10, 7.30pm). Stamford AFC have a Lincs Senior Cup tie against Grantham at the Zeeco Stadium on Monday (July 9, 7.30pm). Fixtures: Saturday - Netherton United v Peterborough Polonia (12.30pm), March Town United v Raunds Town (11.30m), Oakham v Blackstones (noon), Rothwell v Peterborough Sports (noon). Monday : Lincs Senior Cup - Stamford AFC v Grantham. Tuesday: Peterborough Sports v Posh.